Head's up and let it roll to the ground as the title for the movie's official theme and it's performers has been finally revealed! AMAZON!!! Entitled "Eat, Kill All", it will be performed by NoB (Boukenger and Goseiger) and Taro Kobayashi. The movie stars Masashi Taniguchi (Jin Takayama/ Kamen Rider Alpha), Tom Fujita (Haruka Mizusawa/Kamen Rider Amazon Omega), Nobuo Kyo (Kamen Rider Amazon Neo Alpha) and Yo Maejima (Chihiro/Kamen Rider Amazon Neo). 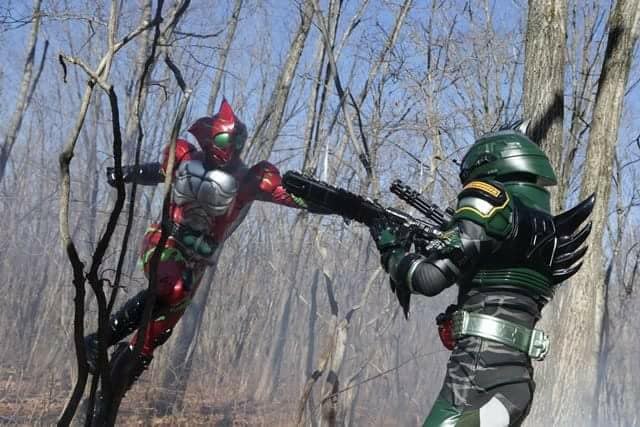 The movie is written by Yuya Takahasi (Kamen Rider EX-AID), supervised by Yasuko Kobayashi (Kamen Rider OOO) and is directed by Hidenori Ishida. Kamen Rider Amazons: Final Judgement is set for a May 19, 2018 release. Anyone know what the Amazon pun is here? Eat, Kill All = ?? ?